The last couple blogpost we published focused on Revealing Queer, an exhibition currently on view at the Museum of Industry and History in Seattle, WA that was spearheaded by Queering the Museum (QTM) and relied on a community-based approach to curation (read: Part 1 and Part 2). Today, we host Nicole Robert, Doctoral Candidate in Feminist Studies and Co-Founder of QTM. She discusses the need to think more broadly about narrative production and collection in museum, proposing digital story telling workshops as a more sensitive and respectful way to include the stories of people who tend to not be well-represented in our institutions. As a founding member of the Queering the Museum (QTM) project, it has been wonderful to see the coverage of the recent exhibit opening: Revealing Queer at the Museum of History and Industry (MOHAI). The exhibit is the visible product of several years of community collaborations. Central to our mission at QTM is to think critically about the processes that go into the creation of museum products. In this post, I will share the processes behind our digital storytelling workshop and the resulting videos. As you know from reading the last two blog posts, QTM collaborated with an extensive Community Advisory Committee (CAC) in the production of three elements that impacted our partnership with MOHAI: a digital storytelling workshop (DSW), a symposium and the Revealing Queer exhibit. With Erin taking the lead as Curator of Revealing Queer, I took the lead with the DSW. 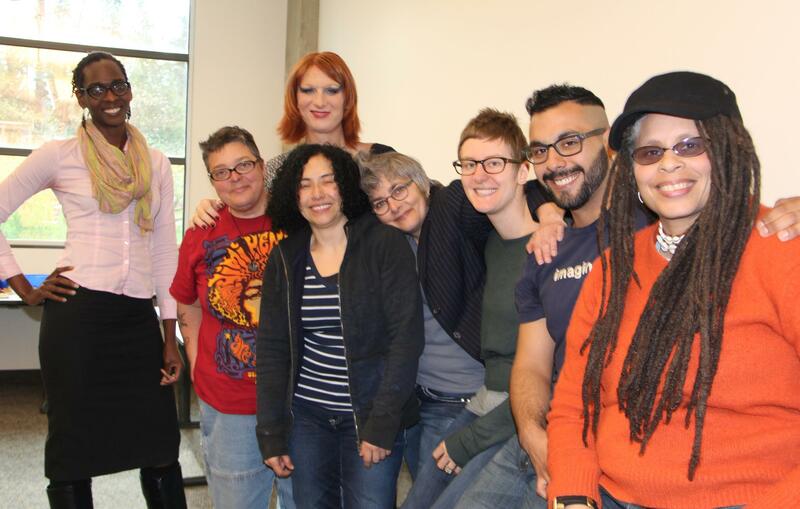 Collectively, the QTM team approached the DSW as an opportunity to include the stories of individuals whose lives are not well-represented within existing archives of lesbian, gay, bisexual, trans* and queer (LGBTQ) materials, due to race, ethnicity, gender and disability. In order to do this respectfully, I drew upon my feminist training to think about the power dynamics at work in this situation. I am a white cisgendered queer woman working with an existing institution (MOHAI) and a student of another large institution (University of Washington). As such, I have access to resources and opportunities that others do not. In addition, established institutions don’t generally have a positive history of working with marginalized populations. In speaking with LGBTQ individuals in the course of my research, I heard many individuals express institutional mistrust and fear leading them to approach individuals with institutional privileges with caution. This awareness is part of what led to the decision to use a digital storytelling workshop rather than an oral history project. While we wanted to add to the existing LGBTQ archives, we also wanted to make sure that individuals could keep control over how their stories were represented. Oral histories contain a lot of valuable information in a format that is not suitable for exhibition, unless the history is edited. This leaves decisions about how an individual gets represented up to a curator or video editor. In contrast, a digital story is a short narrative video that is designed for exhibition and functions as a complete audio-visual representation created by the subject of the video. By choosing this method, we handed representational control to the storytellers. Pictured are our Digital Storytellers: Isis Asare, Mian Carvin, Margaret Elisabeth, Jacque Larrainzar, Fia Gibbs, Petra Davis, Caleb Hernandez and Jourdan Keith. Photo by Angelica Macklin. While I held this specific vision for the DSW, I was fortunate enough to collaborate with Angelica Macklin in the development and production of the workshop. Angelica is a local media-producer and fellow doctoral student in the Gender, Women, Sexuality Studies program at the University of Washington. Our common feminist training coupled with our mutual commitment to social justice and shared authority helped Angelica and I to develop specific practices that guided our DSW. In the following paragraphs, I will detail some of the more significant choices that we made. The workshop itself was a 4 day event in which we facilitated a story-writing and film production process. Angelica and I agreed that the content of the workshop as well as the tools we used in the workshop should be as inexpensive and available as possible. Through QTM, we raised funds to ensure that all participants could attend for free. We chose software that is free and easily available. We advised participants that they are welcome to use any part of the workshop materials in their own life and work; we did not exert copyright over the design of the workshop. We taught participants about the impact of representational choices and the ethics of including people, places, names or existing work. Each participant designed their own copyright agreement—many using Creative Commons—and each participant retains ownership and control over their final video product. Fortunately, participants agreed to let QTM and MOHAI use the videos for the duration of our partnership with MOHAI. Participants have also begun to share their videos in other ways, including film screenings locally and nationally. One of the riskiest decisions that Angelica and I made was to release participants from producing stories with a particular narrative. Once they were in the Workshop, we invited them to reflect on what was most important for them to talk about at that moment in their lives. We were honest about the fact that we hoped to use some of the videos in the Revealing Queer exhibit, but that was not the ultimate goal. We really wanted them to have the experience of creating their own narrative, whatever shape that took. In support of that decision, we allowed participants several months after the workshop itself in which they could decide not to share their video at all. Because the participants engaged with such intimate and revealing topics, this commitment was crucial. In addition, Angelica helped a few individuals re-edit their videos as their ideas of what they felt comfortable sharing publicly changed over the course of time. We now have 8 completed videos in a 35 minute reel that we have screened at a few special events. In addition, each video operates as its own short narrative. 3 of the films were selected for inclusion in Revealing Queer, based on how their content fit the exhibit narrative. All of the films are being shared in their own ways by the individual filmmakers. Ultimately, I am impressed with the intimacy and creativity of the videos that were created. Many filmmakers did not have access to historical photos of themselves and responded to that challenge in inspiring ways. Viewers have found the films relatable and impactful, even as the films play with the ways in which we think about gender and sexuality. At the same time, the narrative structure can make it difficult to understand the larger context of the stories that were shared. The ways in which the storytellers have impacted local history is not always apparent from the videos, so their use for historical research may be limited. Angelica and I put a lot of emphasis on the process of making these films, and I believe that this process was transformative on its own. The workshop participants reported finding community, feeling strength in the collective as well as viewing the significance of their own lives in new and positive ways. As we envision future possibilities for this work, we are conscious of the challenges of archiving, viewing, labeling and sharing digital stories in ways that continue to center the rights of the storytellers. Despite these challenges, the rewards for both the filmmakers and the film-viewers are worthwhile. Nicole Robert’s interdisciplinary interests converge around her commitment to anti-oppression education in both formal and informal environments. Nicole holds an M.A. in Museology and is currently a Doctoral Candidate in Feminist Studies at the University of Washington. Drawing on years of practical experience in museums, her dissertation research focuses on representations of race, gender and sexuality in U.S. history museums. Co-Founder of the Queering the Museum project, Nicole is grateful to collaborate with so many amazing individuals in order to engage museums with queer cultures. Nicole is honored to be a Point Foundation Scholar, a Huckabay Fellow and a recipient of the Doman Teaching Award for excellence in feminist teaching.